When he was 5 months old, Thomas really started showing an interested in what we were eating and drinking; anything he saw us put to our mouth, his eyes would light up and he’d try and grab it. This made me think about starting to wean him – although experts advise that babies should be 6 months old so their digestive system is fully ready, I wanted to give it a go and see how he would respond. Plus Tom’s so active throughout the day he’s burning more energy so introducing solid food seemed like the right thing to do. There is so much information (and judgement!) about the ‘right’ way to wean your baby, and to be honest I wasn’t sure whether to go down the spoon-fed or baby-led route – I know there are pros and cons for both. Either way, according to scientists long-term health is determined by how well we eat in the first 1,000 days of life (from conception to two years) so I was conscious that he was getting goodness from the beginning, whatever the method. Fruit and vegetables are ideal first foods as they help provide essential vitamins and minerals and as weaning progresses, babies should have 5 different portions a day (around 30-40g). 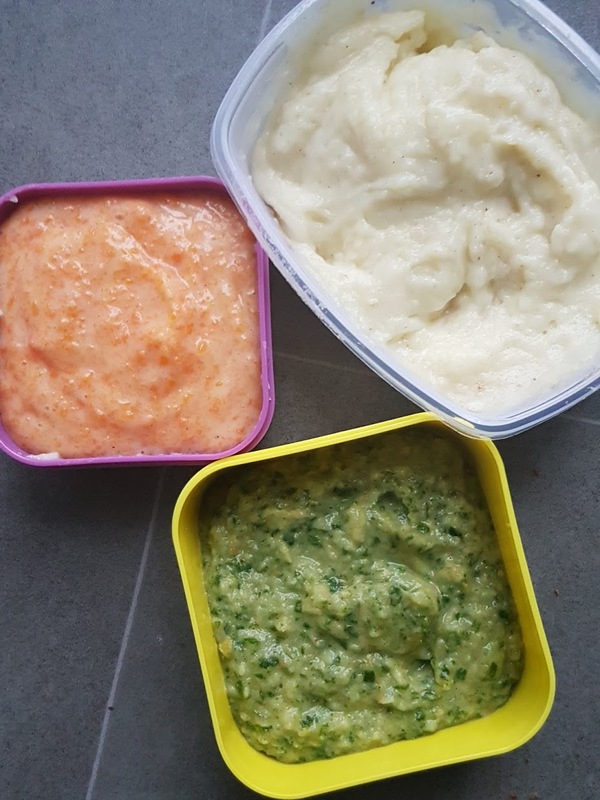 I was aware that babies have a natural preference for sweet flavours and it can be a challenge for them to accept bitter tastes from veggies – it’s recommended to start with a tiny spoonful of a single vegetable puree then try other ones and repeat, allowing 20-25 tries before they accept a new taste so perseverance is key! 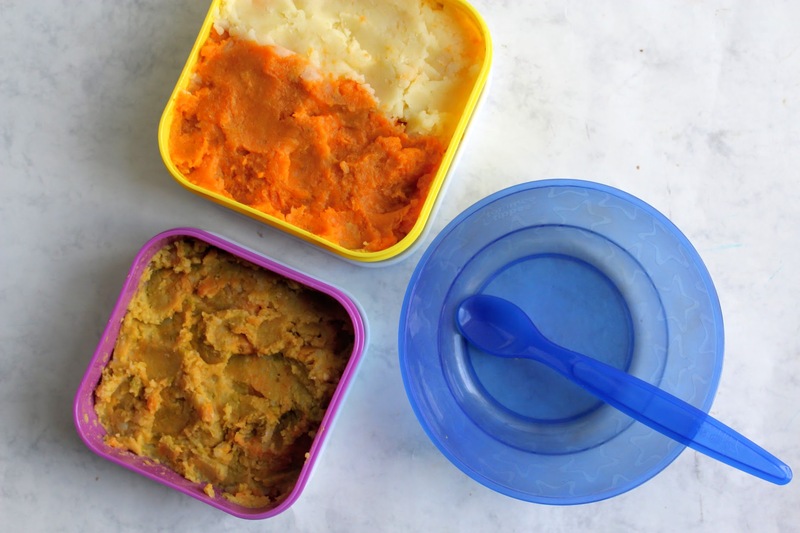 They say that foods introduced during weaning affects what they will eat later in childhood, so this 6-12 months is the perfect time to try a variety of flavours. At this stage they are much more open to eating new foods before they hit the picky toddler years so be adventurous while you can! Just bear in mind to not give your little one too much sugar or salt, honey, raw or undercooked meat, fish or eggs, artificial additives, unpasteurised milk or cheeses. Their little tummies fill up fast so limiting high-fibre foods is advised, as is choosing full-fat dairy products for energy and valuable vitamins which lower fat alternatives might be low in. I started with the basics: A Tommy Tipee plastic bowl and spoon set (an absolute bargain from Poundland! ), a bib and a beaker. 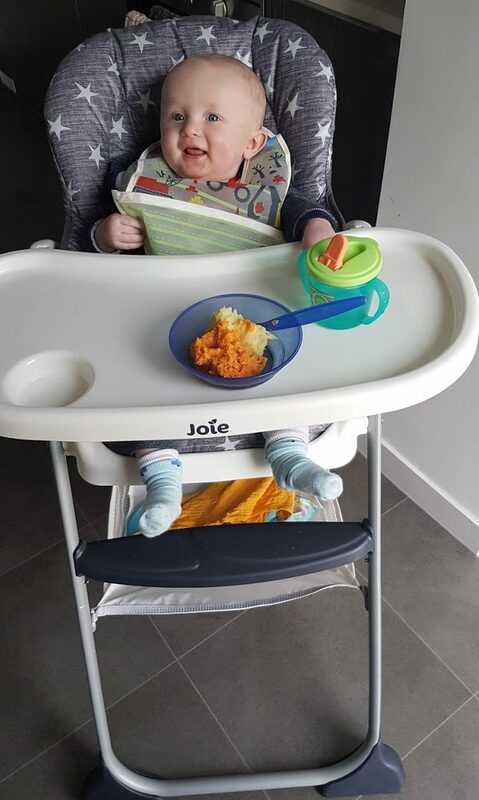 I’d like to say a huge thanks to Housing Units (you might have seen my post about them here) for gifting us with this Joie Mimzy Snacker Highchair to review. When it arrived and took me minutes to set up (no screwdrivers required! ), and once I’d adjusted the straps to secure Tom in, his face lit up as he was able to look around the kitchen and see everything! Its streamlined design means it doesn’t take up too much room in the kitchen and is so easy to fold away – even with one hand – making it compact and easy to transport around. 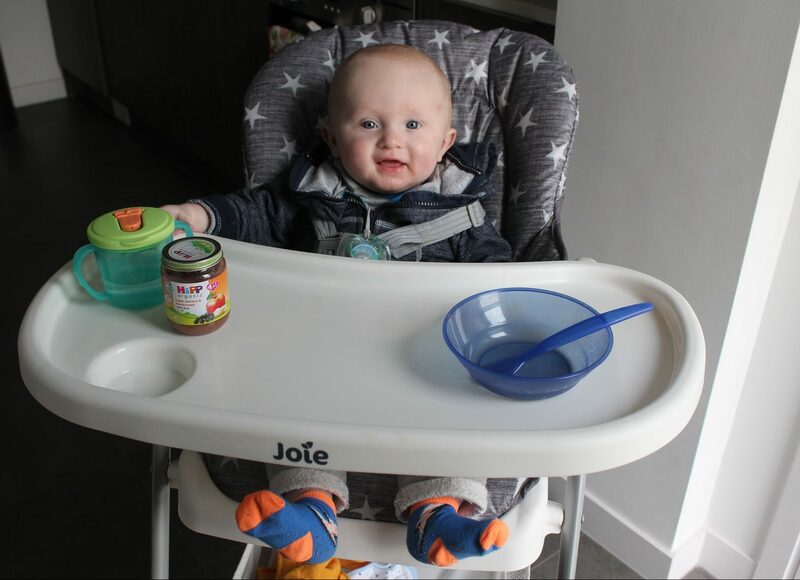 The spacious tray is adjustable and can be clicked onto the back of the seat when not in use which is great for when Tom just wants to sit in the highchair and play. I love that it has a 3-position seat recline for flexible comfort while the oversized storage basket underneath is ideal for popping in wipes, cloths, spare bibs and other necessities. The material is made from removable and wipeable fabric which makes cleaning it pretty easy – which is what you want for something that is intended to get messy regularly! 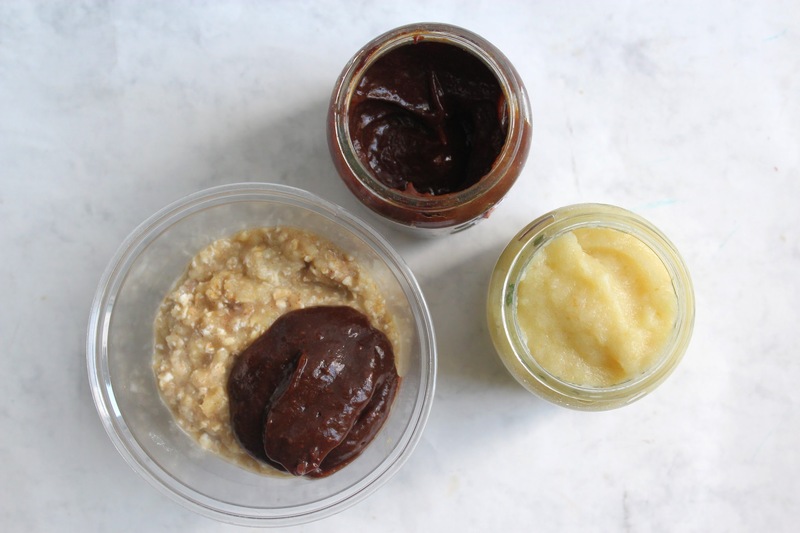 When I started weaning Tom I was kindly sent some jars of 100% fruit puree (Apple, Banana & Blackcurrant; Apple & Pear; Banana & Peach), kindly sent from HiPP Organic which made life easy from the start. I’ve read that it’s a good idea to serve fruit puree with baby rice or porridge to add some flavour which Tom has been enjoying for breakfast as well as with natural wholemilk yogurt as a pudding (I use about ½ or a full jar). He’s been loving them all but particularly the Blackcurrant one – it must be the berries! 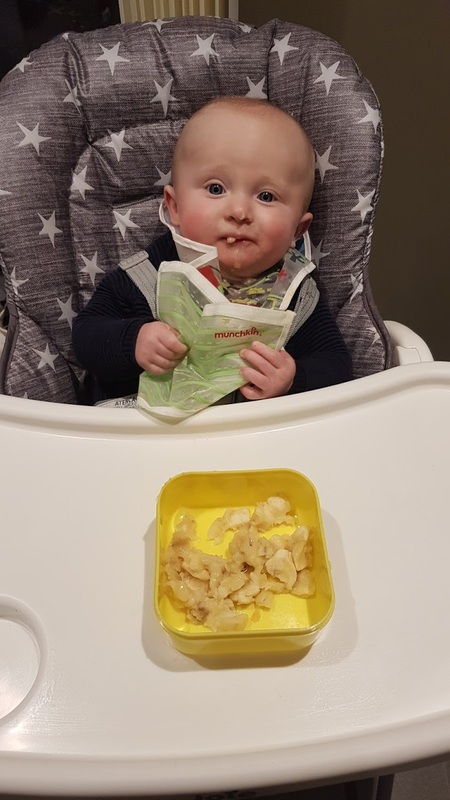 I’m a member for the HiPP Baby Club and I must say I find the emails really useful, informative and interesting, I’ve learnt so much about my growing baby – not just about weaning but everything! I then wanted to include more than just vegetables so I played around with pulses, grains and a little nut butter for extra protein. 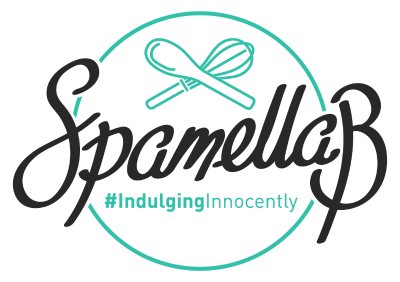 I’m going to give blended cooked meat a go soon as well as well-cooked eggs, full-fat dairy products and other carb sources like rice and pasta (see next post!). I cooked the veggies then blended (potatoes, parsnip & cauliflower; sweet potatoes and carrot) with the drained pulses then mashed well. I cooked everything in water until soft then blended. I drained the dates and blended with water to form a sauce/thin paste. I mixed the apple puree with ground oats, peanut butter and almond milk and left in the fridge overnight. Early on I mashed up banana with a touch of cinnamon or even cocoa powder for an extra treat and Tom just went absolutely crazy for it! He can’t get enough of the fruit, and after a couple of weeks rather than mashing it up, I broke a whole one into very small chunks and left them in a bowl for him to grab and feed himself. This is his current favourite snack and something I’d recommend others to do too (note: expect to find squashed banana in EVERYTHING, even your own hair and clothes!). Another thing I was unsure about was whether to give Tom something to drink as his food increased in-between milk feeds. I read that plain water is the best refreshment for your baby (if they are younger than 6 months you need to boil the water first then cool; after 6 months tap water is ok to use). I keep his little beaker topped up and encourage him to drink some in between mouthfuls and at the end of a meal, he seems to enjoy it and likes to hold it himself, little Mr independent! 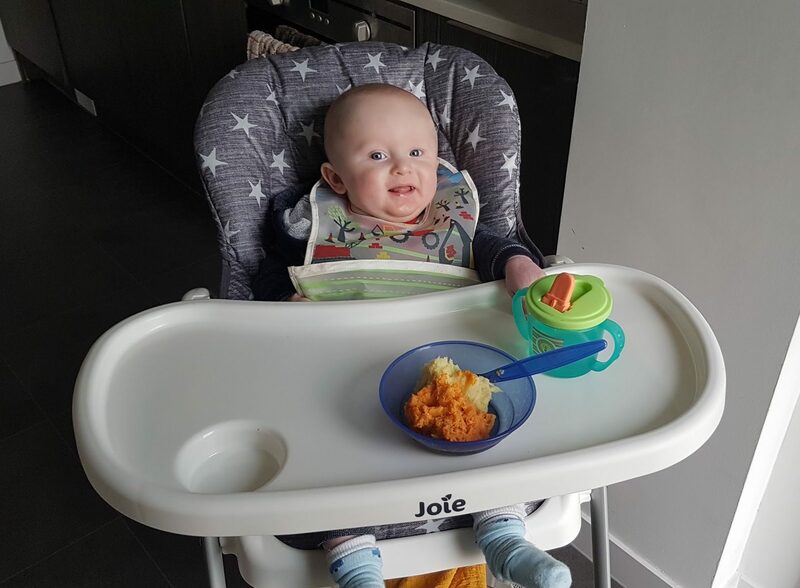 NEXT POST – From 7 months I’m going to be introducing finger foods, more textures, snacks out and about – stay tuned for the next part of our weaning adventure!